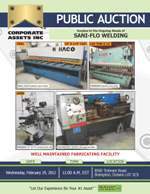 Corporate Assets Inc. | Sani-Flo Welding - Corporate Assets Inc. FEATURING: HACO (1991) 3100/6 hydraulic power shear with 10ft x ¼” capacity; PEARSON 120 ton x 12ft hydraulic press brake; MAGNUM CUT (2006) VM-3V vertical turret mill; SAMPSON LF412E power bending rolls; COLCHESTER TRIUMPH 2000 gap bed lathe; CLARK C500 LPG forklift ; welders, hand tools, shop equipment, qty. Stainless steel valves, clamps, brackets, nuts & bolts, elbows, fittings for the food and pharmaceutical industry, raw material including stainless tube, bar and rectangular.